The Palestinian Health Ministry in Gaza gas confirmed that Israeli soldiers injured 130 Palestinians were injured by live bullets and caused many others to suffer the effects of teargas inhalation, on Friday, as Israeli forces attacked the Great March of Return protests along the Gaza-Israel border. Dr. Ashraf al-Qedra, the spokesperson of the Health Ministry in Gaza, said the soldiers injured 130 Palestinians, with live fire. Dr. al-Qedra added that among the wounding are 30 children and four medics. 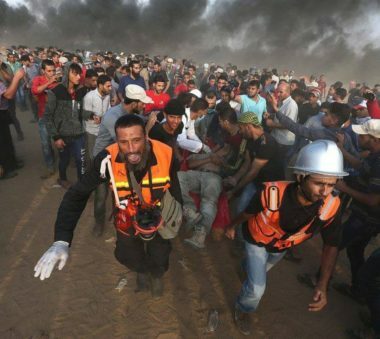 More than 204 Palestinians have been killed and thousands others injured since the outbreak of the Gaza border protests on March 30. The protests call for ending the 12-year-long Israeli blockade of Gaza and for the right of return of the refugees. Most of the casualties occurred on May 14 when Israeli forces attacked Palestinian protesters marking the 70th anniversary of Israel’s occupation of historical Palestine and the ensuing ethnic cleansing of half a million Palestinian refugees. In related news, an Israeli army drone fired a missile at Palestinians, east of Khan Younis, in the southern part of the Gaza Strip, wounding three, and another missile east of the al-Boreij in central Gaza.